Do you feel like you are in an out-to-eat rut? Do you find yourself heading to the same place time and time again? Do you want to try new places, but aren’t sure how it’s going to go? Or, if you even want to spend money on something you aren’t really sure of? Devour Indy: Indy’s city wide dining experience offers families a unique opportunity to try something new without the usual dinner-out price tag attached. With over 200 restaurants offering three-course, value-priced menus and discounts, this is a great time to expand the restaurant horizons. The parents can enjoy a discounted meal for themselves, share with the kids or order something separate for them off the kids’ menu. With so many restaurants participating, this is just a small sampling of what is available for families to choose from. Bazbeaux Pizza originally opened its doors in Broadripple in 1986, and has been an Indianapolis favorite ever since. They have since expanded and are now serving up delectable pizza in three locations, including a Carmel location and downtown location. From classic pepperoni to exotic pizzas sporting shrimp and crab – Bazbeaux has something for all palates. And the variety doesn’t stop with the pizza toppings. You can also choose from wheat, white, gluten-free, or gluten-free vegan crust. Not in the mood for pizza? That’s okay. They have a salad and sandwich menu that will knock you off your feet and have you coming back for more. If you love Italian food, then Bravo is the place for you. The tagline at Bravo is “Fresh. Simple. Authentic.” and that is exactly what their food is. Their kid’s menu features a wide variety of food for the kids to enjoy, such as: a create your own pasta dish, cheese ravioli, mac & cheese, lasagna, chicken parmesan, grilled chicken, grilled salmon, chicken fingers, cheese and pepperoni pizza, two different salads, veggie of the day, fresh fruit, French fries and an ice cream sundae to top it all off. Gluten-free and shy away from Italian restaurants? Not anymore. Bravo has an impressive gluten-free menu with gluten-free pastas, steaks, salmon and salads. The burger is an iconic American food that can be served hundreds of ways. From the classic burger to burgers loaded with a variety of cheeses, jalapeños, bacon. mushrooms, dressings, fried onions and more . At Bru Burger Bar you can choose from a wide array of burgers, appetizers, sandwiches and salads. For the kids, Bru Burger offers: cheeseburger/hamburger (of course), breaded chicken bites, macaroni & cheese, popcorn shrimp and grilled cheese. Calling all wine lovers! If you are looking for a fun family night in an upscale setting, Cooper’s Hawk Winery & Restaurant may be just the place for you. Their menu offers a wide variety of options, including a Happy Hour Menu, Chef Recommendations, Gluten-Free and an exceptional kid’s menu featuring the classics, and some finer fare as well, such as: hamburger or cheeseburger, spaghetti and house-made meatballs, flatbread cheese pizza, chicken potstickers, chicken tenders, grilled cheese, mac & cheese, junior filet medallions, soy ginger glazed Atlantic salmon, parmesan chicken with angel hair marinara, Mary’s potatoes, French fries, Asian slaw, grilled broccoli, green beans and carrots. Still hungry? Your littles can have either a scoop of vanilla ice cream or an ice cream sundae for dessert. Yum. Yum. Firebirds has plenty to offer family members of all ages. From specialty wood-fired steaks and seafood to delectable salads (and let’s not forget the lobster spinach queso – oh my! ), everyone is guaranteed to leave with full bellies. And the best part? As stated on their website, Firebirds has “made a big commitment to our littlest guests. From the quality of our food to the warm welcome we extend to kids, we’re a restaurant for every member of the family.” The kid’s menu “is part of the Kids LiveWell program and has been verified by the National Restaurant Association and Healthy Dining to meet specific nutritional criteria established by leading health organizations’ scientific guidelines.” They offer: fish tacos, grilled chicken breast, wood-grilled steak, wood-grilled mahi, shrimp tacos, half rack of ribs, smoked chicken wings, mac & cheese, burger, chicken fingers and a wide variety of sides. Granite City offers a wide variety of tasty food that is sure to please even the pickiest of eaters. Their menu features a Chef’s Seasonal Menu, Happy Hour Menu, Gluten Sensitive Menu, their incredible Lawless Brunch, Daily Food Specials and let’s not forget – the Kid’s Menu. On their kid’s menu you will find: quesadilla, macaroni & cheese, pepperoni flatbread, chicken bites, grilled salmon, saucy pasta, grilled chicken breast, steak burger, golden grill and a large selection of sides. And let’s not forget about dessert. At Granite City, they offer a kids’ brownie or a yummy ice cream sundae – if you still have room in your belly that is. Let’s be honest here – there’s always room for dessert! The wide assortment of appetizers, entrees, soups, salads, steaks, burgers, sides and more are all sure to please. At Houlihan’s there is something for everybody. Arrive hungry and leave happy. If your child is an adventurous eater and likes to try exotic, yummy food – then you should definitely give Kizuki Ramen & Izakaya a try. The name says it all. This restaurant offers exactly what it promises – Ramens, Izakaya and rice dishes as well. Who doesn’t love a good meatball? At Mimi Blue Meatballs you can choose between Classic, Turkey, Beef, Buffalo Turkey and Special. Not a meat eater? No worries. They offer vegan meatballs as well. In addition to meatballs, you can choose from salads, sandwiches, meatball sliders and a variety of sides. A perfect meal for kids and grown-ups alike. If you have any burger lovers in your house, Prodigy Burger & Bar is the place for you. They offer their patrons a wide variety of fresh, never frozen burgers including Waygu burgers. Not in the mood for a burger? No problem. There is plenty more on the menu that is sure to satisfy. For the little ones, they offer grilled chicken and broccoli, pepperoni pizza, mac & cheese, two mini cheeseburgers, grilled cheese and chicken tenders. Located in the Village of West Clay, Sahm’s is serving up tasty dishes for the entire family. Their kid’s menu features: mac & cheese, buttered Cavatappi noodles, chicken or cheese quesadillas, cheeseburger or hamburger, chicken fingers and grilled cheese. Squealers offers mouth-watering, award-winning, southern-style barbecue that is prepared fresh daily. Their piglet menu for children ages 12 and under includes tasty items such as: kid’s pulled pork, kid’s pulled chicken, a kid’s burger, kid’s ribs and more. Ted’s Montana Grill has been serving American classics for years in a warm environment modeled after the saloons of the 19th century. A staple of Ted’s menu is bison and they proudly serve more bison than any other restaurant in the world. So it’s no surprise that you can find a bison burger, bison meatloaf and bison pot roast on the kid’s menu. In addition to the bison that they are so well known for, the kid’s menu also offers: cheeseburger, grilled cheese, mac & cheese, chicken tenders, grilled chicken, cedar plank salmon, five different types of salads, sides and dessert. Woody’s Library Restaurant is a Carmel favorite. Upstairs, you will dine surrounded by books and artwork in a cozy atmosphere resembling the original library. Or, if you prefer to dine downstairs, you will find yourself in a fun pub atmosphere with televisions, a juke box, shuffleboard and a giant fish tank that will definitely help keep the kids entertained. Woody’s menu offers a wide variety of American classics, comfort food, tacos, burgers and more. A kid’s menu is available upon request. If you enjoy wood smoked barbecue, you will definitely want to give Barbecue and Bourbon on Main a try. Serving a wide array of sandwiches, dinners featuring an entree and two sides with cornbread, and platters where you choose from one to four meats, two sides and cornbread. A perfect meal to share! Located across from the Indianapolis Motor Speedway you will find this family owned restaurant featuring one of the best Hoosier tenderloins around. Dawson’s on main serves a wide selection of appetizers, pastas, steaks, seafood, sandwiches and wraps, pizza and more. The expansive menu at Grindstone Charley’s is sure to have something for even the pickiest of eaters.They offer nine different items on the kid’s menu and a plethora of side dishes. Their kid’s menu even has a gluten-free cheeseburger option available for guests. If you go on a Sunday then you’re in luck – kids eat FREE every Sunday. Originally shipped via railroad to Plainfield in 1954, the Oasis Diner is more than just a restaurant – it’s a piece of history. When you enter this establishment, you will feel like you have stepped back in time. Their menu offers all the classics you would expect at an American diner – breakfast food, loaded fries, burgers, dogs, grilled cheese, a hand-breaded Indiana pork loin and milk shakes – of course! Check out their website for more information on this historic diner. This charming, quaint restaurant located in Moorseville is the perfect location for a family night out. At Ralph and Ava’s they value quality food, entertainment and community and have found a way to incorporate all of this in their establishment. Their kid’s menu features: grilled cheese, chicken nuggets, PB&J and a fluffernutter sandwich with peanut butter and marshmallow cream. Looking for exceptional tacos served up in a quaint, fun environment? Look no further. Located across from the Indianapolis Motor Speedway, Tacos and Tequila on Main offers botanas (appetizers), tacos, burritos, tortas, cena (dinner), a wide assortment of sides and dessert. For the Ninos, they have: gringo tacos, cheese quesadillas and nachos. At Rock Cola, you and your family will enjoy a throwback meal 50’s style – in a retro diner complete with pink walls, turquoise booths and a checkered floor. The environment is fun and the food is delicious. In true diner fashion, they are offering breakfast, lunch and a wide variety of hand-mixed floats, shakes and malts. Stone Creek Dining has an incredible selection of mouth watering foods for young and old alike. For the little ones, Stone Creek offers: penne pasta, chicken fingers, grilled cheese, grilled chicken breast, bistro steak, chicken parmesan, cheeseburger or hamburger, popcorn shrimp, barbecue ribs and a wide assortment of sides. 317 Burger is serving up American classics. Their burgers are made with 100% fresh, premium Black Angus beef and their fries are hand-cut to perfection. At 317, fresh, quality ingredients are the name of the game. Their kid’s menu includes: hamburger (of course), grilled cheese, pulled pork, mac & cheese, chicken fingers, nachos and sides. Any pizza lovers in your house? If the answer is yes (and I’m assuming it is), you will want to give Byrne’s Grilled Pizza a try. Byrne’s serves delicious hand-made, thin crust, grilled pizza. Not in the mood for pizza? No problem. They also offer: stromboli’s, salads, appetizers, pasta, dessert and even a breakfast pizza for the breakfast lovers. Diavola is an Italian restaurant using the finest ingredients, featuring: housemade pastas, handcrafted Italian-style pizzas, insalate, antipasti and a calzone that changes weekly. Napolese proudly serves quality food using fresh, local ingredients. Their extensive menu features: soup, starters, salads, artisanal pizzas, or if you are feeling creative you can freestyle and create your own (although they recommend no more than three ingredients), Neapolitan sandwiches and a wide assortment of mouth watering desserts. For the littles ages 8 and under, Napolese offers a cheese pizza with the option of adding additional ingredients. This casual, informal restaurant offers affordable, sustainable, wholesome, non-processed and incredibly tasty food. The kid’s menu features: ND beef burger, mac & cheese, grilled or fried chicken tenders, cheeseburger slider, grilled cheese and an assortment of sides such as: rice and beans, kale chips, tomato soup and garden salad – to name a few. This farm to table restaurant features a wide array of international dishes with vegan and vegetarian options. All of the food is made from scratch including all of the sauces, soups, dressings and even ketchup. At The Corner, you can enjoy comfort food, live music and good company. With a menu featuring incredible brunch items, light snacks, seafood, pasta, meats and sides to share family style – plan to arrive hungry and leave happy. 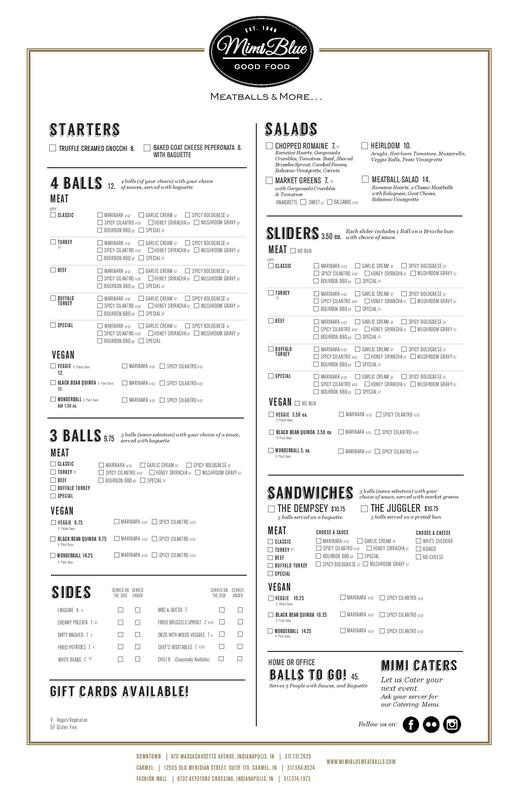 Burger Study serves premium burgers made from the best quality Midwest prime beef as well as a wide variety of shareables, greens, sandwiches and sides. Located on the Cultural Trail in the ground level retail space at the Villaggio, you will find this comfortable, quaint eatery. Serving a variety of menu items such as: pasta, burgers, specialty sandwiches, salads, weekday features and more. For kids they offer: cheeseburger, cheese pizza, pasta with butter sauce, grilled cheese, chicken tenders and mac & cheese. Looking for incredible, authentic Italian food served in a family-friendly environment? Look no further. Iaria’s diverse menu features a wide array of delectable cuisine that is sure to leave everyone in your family grinning from ear to ear. And let’s not forget – all sauces are original family recipes and are made in house. Yum. Yum. Chicken and waffles, anyone? Um. Yes, please. Maxine’s is serving up incredible breakfast, lunch and dinner items that are sure to please. This is comfort food at its best. For the littles, Maxine’s offers: kid’s chicken and waffles, chicken nugget basket, kid’s dusty, fish basket, grilled cheese basket, pancakes and a mini fat burger. If you like Mexican food, you definitely want to give Mr. Tequila’s Cantina & Grill a try. Their menu is both extensive and impressive – offering fresh, authentic Mexican fare. Here is what Mr. Tequila’s is serving the little ones: cheeseburger or hamburger, sincronizada (ham and cheese quesadilla), chicken tenders, cheese quesadilla, pepperoni pizza, mac & cheese, taco, breaded or grilled shrimp and grilled cheese. If you are eating Paleo, you may find going out to eat to be a challenge. Not anymore. Nook is committed to serving you all foods paleo with locally sourced whole foods and a focus on clean eating – Nook was voted the healthiest restaurant in the city and state. You can’t go wrong by taking your family to Punch Burger where they offer specialty burgers, grilled cheese, fry baskets, sides and shakes. Rooster’s Kitchen offers their guests homestyle comfort food such as: shareables, salads, Buddha Bowls (gluten-free grain bowl), sandwiches, a variety of mac & cheese dishes and their Neanderthal featuring a selection of a meat with two sides. The Weber Grill Restaurant features the taste of classic outdoor grilling that we all know and love. At Weber Grill you will find classic American comfort food and more. For the kids, Weber offers: BBQ pork ribs, hot dog, cheese pizza, cheeseburger, chicken tenders, grilled cheese, steak skewers, mac & cheese and grilled chicken breast. Devour Indy runs January 21 through February 3. To participate, simply look over the list of restaurants and make your choice. No passes or coupons are required to participate. Reservations aren’t necessary, but are highly recommended. Not all restaurants accept reservations – you will want to visit the website or call to find out if they are accepted. Visit their website for a complete listing of all participating restaurants. Best Family-Friendly Places to Dine Outside in Indianapolis Dine al fresco with your family this summer!